If you are looking for a free but quality day out and need fun activities to entertain the family, then you will LOVE Wakefield Museum. 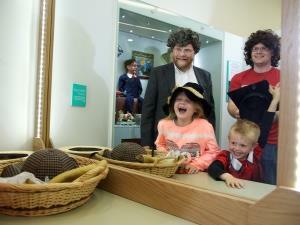 Wakefield Museum is jam-packed with fabulous activities for families. Have fun learning about the history of our city and look at objects from far and wide. Have a go at some of our hands-on activities – clock in; make a mixed up animal; try on a wig; make a Tudor building; spot enemy planes or drive the rhubarb express. Travel to the extraordinary world of Charles Waterton, the world’s first eco-warrior, and come face to face with some of the animals he collected from all over the world…but watch out for the crocodile! If all that isn’t enough then spend some time in the Front Room – an action packed area specially designed for children. Cook up a treat; try on some crazy costumes; get creative; step back in time with our Victorian kitchen and 1940s living room. Phew…if that doesn’t wear them out, what will?